Interesting – I’m pretty sure the owner of that pub (well, when it was Body in the Bog, at least) owns the surrounding shopping center. I wonder if it’s fallout from Parma moving out? Not a good combo for the area, for sure. I totally agree. The shopping center lost a Longs and a Blockbuster, too (which I care less about). Hopefully the pub finds its way back. There aren’t many places to hang out and have a drink in these parts. They also had an incredible beer selection. I just wish I was 10 miles closer at any point during my day. The pub’s about a block away from where I live. I’m kicking myself for not hanging out there more often, instead of other places. I just couldn’t resist the lure of the sexier Tower District, I guess. Who knows, though. Perhaps it will reopen and I’ll have another chance. This is a shame – I’m a little hazy on the pub’s history, but thought that the “original” owner (from Body in the Bog) had re-opened it after its stint as Moynihan’s. It was a great little pub with an awesome selection. 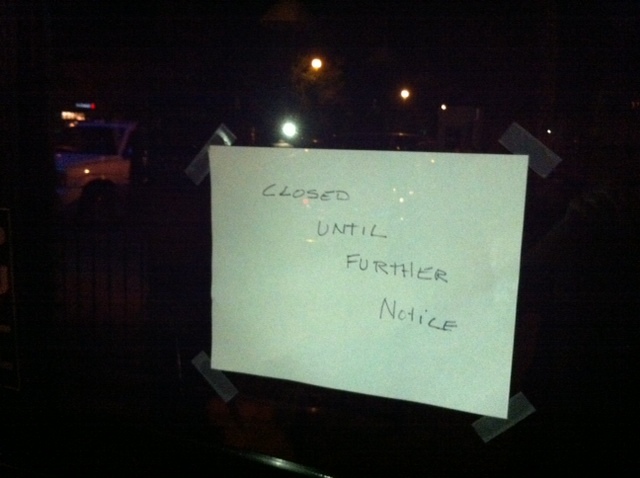 Now that I live nearby, I’d been meaning to get back in there, so naturally it just closed down. Funny – when I saw the article headline, I had a sinking feeling that this was the pub of which you spoke. That’s what I’d heard, too.